A recent shot has been released of Johnny Depp in his new role as Tonto in the Lone Ranger remake. 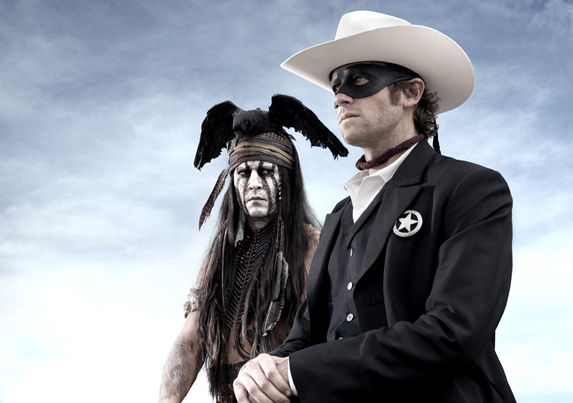 Tonto “wild one” is depicted in the movie as a native american from the Potawatomi nation. Native Americans are known to have connections with the spiritual realm. This is done by a rite of passage called a Vision Quest. A Vision Quest is an initiation often depicted as a personal journey consisting of fasting. The individual will continue until he/she is open to the spiritual realm. During this time, a guardian/demon will give direction to the individual. A wyakin is actually defined in the Nez Perce (Native Americans) Language as an occultic force. Once the state of comatose is reached and the individual has a dream, the Vision Quest is complete. The individual will now have a “spirit guide”. If the individual had to make a decision or in need of help, they would consult/invoke their “wyakin” to get an answer or protection. They would go on to claim of supernatural abilities, which is not too far fetched given they had been consumed by demonic control. Johnny Depp found the appearance he was looking for in one of Kirby Sattler’s “I Am Crow” painting. View painting here. http://www.sattlerartprint.com/iamcrow.html. The painting depicts an indian chief. 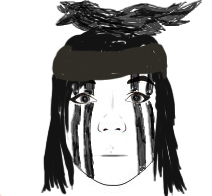 His face painted white with four black vertical lines atop a white clay painted face. Face painting is commonly known as “war paint” but it also designated power, membership and was used in ceremonies. This would be a mental preparation for an event that would literally change the people. The color of the paint would also have meaning. 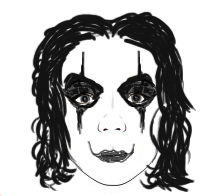 Although Depp did not star in this movie, we find similarities depicting this type of revenge in “The Crow”. A gothic action film based on revenge by a resurrected being executing judgement on those who had murdered him. His face was also painted in like manner. This character is “guided” by a crow who provides him with invincibility. Depp goes on to describe the significance of the stripes into quartered personalities. He then goes on explaining the reasoning of having a “crow hat”. Depp said of acting as the transvestite crazed Ed in the movie “Ed Wood”. This seems to be something he feels comfortable participating. Is this how Depp achieves this? We all know that God is not the author of confusion 1 Cor. 14:33. If God is not the author of confusion, then who is creating these characters that Depp emits? Depp, in his own words, explains that it is the demons that provide the source of his character development or performance. This could be why he understands how spirit guides work.